In the seventh century A.D. the Snake rulers presided over this capital city—in what today is southern Mexico—and its largest structure, a pyramid 180 feet tall. From Calakmul they managed an intricate web of alliances. This story appears in the September 2016 issue of National Geographic magazine. Your National Geographic Society membership helped fund recent excavations at Holmul and La Corona, Guatemala. The ancient city of Holmul isn’t much to look at. To the casual observer it’s just a series of steep, forested hills in the middle of the jungle in northern Guatemala, near the Mexican border. The jungle here in the Petén Basin is thick and warm but drier than you might expect. And silent, except for the drum of cicadas and the occasional calls of howler monkeys. The site was a thriving settlement during the Classic Maya period (A.D. 250-900), a time when writing and culture flourished throughout what is today Central America and southern Mexico. But it also was a time of political upheaval: Two warring city-states were locked in perennial conflict, grappling for supremacy. For a brief period one of those city-states prevailed and became the closest thing to an empire in Maya history. It was ruled by the Snake kings of the Kaanul dynasty, which until just a few decades ago no one even knew existed. Thanks to sites around this city-state, including Holmul, archaeologists are now piecing together the story of the Snake kings. Holmul isn’t a big, famous site like nearby Tikal, and it was mostly ignored by archaeologists until 2000, when Francisco Estrada-Belli arrived. An Italian-born Guatemalan, he’s ruggedly handsome with scruffy hair and a relaxed demeanor. He wasn’t looking for anything fancy, such as Classic-era written tablets or ornate burials—just some insight into the roots of the Maya. One of the first things he found was a building a few miles from what appeared to be Holmul’s central cluster of pyramids. In it were the remnants of a mural portraying soldiers on a pilgrimage to a faraway place. Oddly, parts of the mural had been destroyed, apparently by the Maya themselves, as if they’d wanted to erase the history it depicted. Hoping to understand why, Estrada-Belli tunneled into several nearby pyramids. Ancient Mesoamericans built their pyramids in stages, one on top of the other, like Russian nesting dolls. When the people of Holmul added a new layer, they preserved the one beneath, which has allowed researchers to tunnel in and see previous structures almost exactly as they were left. In 2013 Estrada-Belli and his team worked their way into one of the larger pyramids, tracing an ancient staircase to the entrance of a ceremonial building. Climbing up through a hole in the floor, they discovered a 26-foot-long frieze, marvelously preserved, above the entrance to an ancient tomb. Stucco friezes are very rare and fragile. This one depicted three men, including a Holmul king, rising from the mouths of strange monsters flanked by underworld creatures, entwined by two giant, feathered serpents. The artwork was iconic and strikingly vibrant. As Estrada-Belli gazed at the frieze, he noticed a series of carvings at the bottom. Kneeling down, he saw a ribbon of characters, or glyphs, listing the kings of Holmul. Near the center was a glyph that he knew at once was the most electrifying discovery of his career: a grinning snake. The story of the discovery of the Kaanul, or Snakes, and their effort to create an empire begins in Tikal, the city of their most hated enemy. Just as Tikal dominated the Maya lowlands for centuries, it has dominated Maya archaeology since the 1950s. The sprawling city once had a population approaching 60,000, and its elegant buildings surely dazzled visitors in A.D. 750, much as they do tourists today. It also had hundreds of beautifully carved tombstone-like blocks called stelae. Using the inscriptions on them, scientists reconstructed Tikal’s history until its fall in the ninth century. But there was an odd gap—roughly from 560 to 690—when no stelae were carved and little else was built. Baffled by this 130-year break, archaeologists called it the Tikal hiatus and chalked it up as a mystery of the ancient Maya. Archaeologists began filling in the gap in the 1960s, when they noticed an odd glyph scattered around various Classic sites—a snake head with a clownish grin and surrounded by markings associated with royalty. In 1973 archaeologist Joyce Marcus recognized it as an emblem glyph—words for a city and ruling title that served as a sort of coat of arms. She wondered if it could be related to the Tikal hiatus. What if some unknown warriors had conquered the city? If they had, where would such a force have come from, and wouldn’t archaeologists be familiar with it? Dig deeper into a dynastic saga that spans 200 years and at least six generations. Clicking on the right arrow will make all 15 notes appear in order. The jungles of the Petén are hot and parched in the dry season and nearly impassable in the wet season. They’re infested with poisonous plants and insects and menaced by armed drug runners. Nevertheless Marcus explored them for months, visiting ruins and collecting photos of glyphs. Everywhere she went, she saw references to the grinning snake, especially around the ancient city of Calakmul, in what’s now Mexico, near its southern border. When she got to Calakmul, whose two central pyramids were easily visible from the air, she was amazed by its size—roughly 50,000 people once lived there. Stelae were strewn everywhere, but most of them were blank. The limestone was so soft that centuries of erosion had wiped them clean. She found only two snake glyphs in the city. The mystery of the snakes prompted a young British researcher, Simon Martin, to assemble all the information he could about the snake glyphs from Calakmul and smaller sites. He used hints of battles and political intrigue from around the Maya world to form a picture of the Snakes and their dynasty. Take in the grandeur of Calakmul as you swoop over and around its 180-foot-tall pyramid in this soaring aerial video. Eventually Martin and archaeologist Nikolai Grube published a book called Chronicle of the Maya Kings and Queens, which described the intertwining histories of the kingdoms of the ancient Maya world. At the center of that world, for one shining century, were the Snakes. Like Marcus, Martin says the Snake kingdom was a sort of black hole—one that sucked in all the cities around it and created what might have been a Maya empire. Of course there are still many questions about the Snakes: how they lived, ruled, and fought—and even whether some of them were real. At the end of the fifth century, Tikal was one of the most powerful city-states in the region. Archaeologists suspect that it held its position with the help of a much larger city high in the mountains 650 miles to the west called Teotihuacan, near today’s Mexico City. For centuries these two cities shaped Maya painting, architecture, pottery, weapons, and city planning. But all that changed in the sixth century, when Teotihuacan disengaged from the Maya region, leaving Tikal to fend for itself. Enter the Snakes. No one’s sure where they came from; there’s no evidence of them ruling Calakmul before 635. Some experts imagine them hundreds of years before the Classic era, moving from place to place, creating one megacity after another. But this is guesswork. The first obvious snake glyphs seem to appear in Dzibanché, a city in southern Mexico, 80 miles northeast of Calakmul. Wherever the Snakes were based, we know that starting in the early sixth century two successive Snake kings recognized that Tikal was vulnerable and made a bold play for political control. The first, Stone Hand Jaguar, spent decades making courtesy calls throughout the Maya lowlands. These visits might seem innocuous now—orchestrating a wedding, playing an ancient Maya ball game (a sport involving a ball, several sticks, and stone hoops), perhaps just dropping by to say hello. But this was how conquest often happened in the Maya world—by offering gifts, paying respects, building crucial allies. No one seems to have been better at this than the Snakes. Soon Tikal’s southeastern ally, Caracol, was siding with the Snakes, as was Waka, a warlike city to the west. The Snakes patiently gathered the loyalty of other cities to the north, east, and west of Tikal, forming a giant pincer to squeeze their foe. Stone Hand Jaguar and his allies were finally ready to make their move on Tikal, but the Snake lord died before his political maneuvers could pay off. It fell to his successor (and perhaps son), Sky Witness, to spring the trap. The young king must have cut an impressive figure. Scientists who’ve examined his remains say he was powerfully built and that his skull was battered from untold battles, with scars on top of previous scars. According to inscriptions on an altar in Caracol, Sky Witness put an end to Tikal’s reign on April 29, 562. The king put all the pieces in place, then struck. He led the Snake army east from Waka, while forces from Caracol, the nearby city-state of Naranjo, and probably Holmul moved west. The Snakes and their allies quickly crushed Tikal, sacked it, and likely sacrificed its king with a stone blade on his own altar. It’s probably at this time that the people of Holmul nearly destroyed the mural that Estrada-Belli would find more than 1,400 years later—which honors Tikal and Teotihuacan—as a sign of loyalty to their new Snake lords. The reign of the Snakes had begun. The next 30 years of Maya history are a bit fuzzy. Thanks to Mexican archaeologists Enrique Nalda and Sandra Balanzario, we know that Sky Witness died 10 years after his victory, when he was in his early 30s. In 2004 they uncovered a series of tombs in a pyramid at Dzibanché in which they found a bone needle used for blood rituals amid jade masks, obsidian, and pearls under a thick coating of cinnabar dust. Markings along one side of the needle read, “This is the blood offering of Sky Witness.” Of the eight Snake kings who ruled during Tikal’s hiatus, he’s one of just two whose remains have been found. The next time the Snakes appeared was far to the west, in the lavish city of Palenque. Unlike the drier lowland metropolises of Tikal and Calakmul, Palenque was refined and sophisticated, its elegant stucco-covered pyramids and watchtower nestled in the foothills of the mountains that led to the Gulf of Mexico and the central highlands. Thanks to its ample rivers and waterfalls, it had plenty of water and even may have had toilets with running water. It wasn’t a big city—maybe 10,000 people—but it was a beacon of civilization and a gateway for trade to the west, a prime target for an ambitious young power. The Snakes were led then by a king named Scroll Serpent who, like his predecessors, invaded using proxies and allies. Palenque’s queen, Heart of the Windy Place, defended her city against the Snake onslaught but surrendered on April 21, 599. Such expansionist impulses were rare among the Classic Maya, who often are described as quarrelsome and disjointed, focused on their territories without larger ambitions. The Snakes were different. 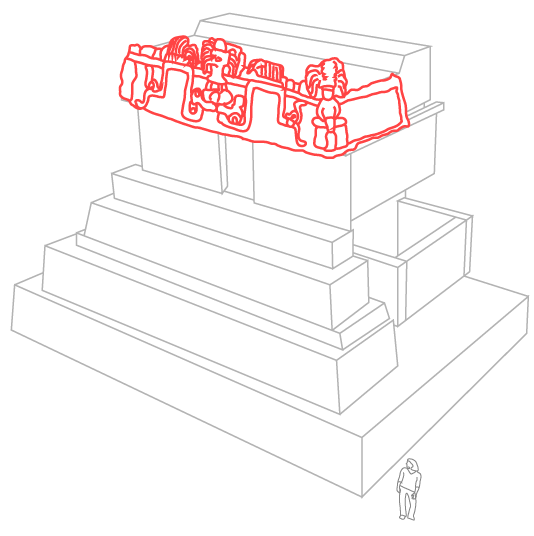 The idea of empire building is controversial among Maya archaeologists. For many the concept is culturally and geographically implausible. Still, looking at the Snakes, it’s hard not to see a pattern of expansion. They made allies of the biggest cities to the east, conquered those to the south, and traded with people to the north. Palenque represented the edge of the Maya world to the west. Yet without horses and standing armies, how could they hold it? Influencing such a far-flung region, perhaps as large as the U.S. state of Kentucky, required a kind of organization never before seen among the Maya. It also required a new seat of power, one closer to the jade-rich cities in the south. Dzibanché was almost 100 miles from Calakmul, an impressive distance for people on foot in thick jungle. There are no records of the move to the new capital of Calakmul, but in 635 the Snakes erected a monument declaring themselves the masters of the city, having displaced a dynasty there known as the Bats. Within a year the greatest of the Snake rulers—perhaps the greatest Maya king ever—took the throne. His name was Yuknoom Cheen II, or Shaker of Cities, as he is sometimes called. Sky Witness and Scroll Serpent had been adept conquerors, but Yuknoom Cheen was a true king. Like Cyrus in Persia or Augustus in Rome, he deftly played one city against another—bribing some, threatening others—while consolidating his hold on the Maya lowlands unlike any Maya king before or after. And he kept up this political balancing act for 50 years. The best way to understand a king can be to meet his servant. Similarly, the best way to understand an empire is often to look at a client city. Perhaps the most interesting servant to the Snakes was a small, otherwise unremarkable city called Saknikte. In a sense, archaeologists discovered the site twice. By the early 1970s they’d come across a series of stone panels circulating on the black market. Gorgeously crafted with intricate texts, the panels had been looted by thieves and sold abroad with no way to trace their origin. Sprinkled among them were glyphs of a grinning snake. Archaeologists named the unknown place where the looters had found them Site Q.
Tikal was a superpower until the rise of the Snake kings in the sixth century. The future overlords, perhaps based at Dzibanché, made alliances with cities (in red) around Tikal (its allies in black) that allowed them to crush their rival in 562. By 635 the Snake dynasty had moved its capital to Calakmul. A king named God That Clears the Sky kick-started Tikal’s return to supremacy with a decisive victory over Calakmul (now with two more allies, in gray) on August 5, 695. Canuto has been there ever since. Saknikte, the site’s Maya name, seems to have had a special status in the Snake kingdom. Its princes went to Calakmul for education, and three of them wedded Snake princesses. Unlike the martial city of Waka just to the south, Saknikte didn’t fight many battles. Its kings had peaceful names that translate roughly as Sunny Dog, White Worm, and Red Turkey. Panels tell of nobles drinking alcohol and playing flutes. According to carved panels found by Canuto’s team, Yuknoom Cheen paid a visit just before the Snake capital officially moved to Calakmul. The elegant portrait shows Yuknoom Cheen seated, looking relaxed, glancing off to the side as Saknikte’s king looks on. Saknikte wasn’t the only place where the Snakes were building influence. Yuknoom Cheen’s name appears throughout the Maya region. He married off his daughter Water Lily Hand to a Waka prince; she later became a powerful warrior queen. He installed new kings in Cancuén, to the south, and Moral-Reforma, nearly a hundred miles to the west. In Dos Pilas he conquered the brother of Tikal’s new king and turned him into a loyal vassal. He also established a new trade route on the western side of his kingdom, linking various allies. Scientists have noticed an oddity of these vassal cities. It seems that certain close allies didn’t have their own emblem glyphs, and their kings, though sumptuously adorned, didn’t use kingly titles once they fell in with the Snakes. Meanwhile, the Snake kings of Calakmul took on a more sweeping title: kaloomte. King of kings. All the while the Snakes kept their eye on their old enemy, Tikal, which repeatedly tried to rise up and take revenge. In 657, after shoring up his allies, Yuknoom Cheen and a nearby puppet king, an ambitious man named God That Hammers the Sky, struck Tikal. Two decades later Tikal rose up yet again, and the Snake king once more orchestrated its defeat, killing its king in the process. How was Tikal still able to threaten the seemingly omnipotent Snakes? Experts say Maya kings had to be careful when maintaining alliances and often left defeated kings alive. It could be that Classic Maya battles were mostly ceremonial. Or perhaps the allies of defeated kings—worried that their own throats could be next—pushed for mercy. Or maybe Maya kings typically didn’t have big enough armies to wipe out a city. Whatever the reason, Yuknoom Cheen played a delicate game of politics. Rather than hand over Tikal to his ally God That Hammers the Sky, he held a peace summit with Tikal’s new king. It was then that he introduced his successor (and likely son), Claw of Fire, who one day would inherit the kingdom. And ultimately lose it forever. Around the advanced age of 86, Yuknoom Cheen died. Most Calakmul citizens would have been lucky to live half as long, but their kings were a pampered breed, dining only on soft tamales, so that even their teeth looked unusually young. Malnutrition was pervasive in the poorer classes, but elites could be overweight and some may have had diabetes. Some suggest that Claw of Fire was just such a man. He likely was running the kingdom long before his father died. But as with the sons of many great kings, he fell far short of his father. Despite multiple crushing defeats, Tikal rose up again in 695. This time it was led by a young king, impressively named God That Clears the Sky. Claw of Fire raised another Snake army to face the Tikal upstart. We don’t know exactly what happened that August day. Some experts think that God That Hammers the Sky, bitter about various snubs, betrayed his Snake allies on the battlefield. Others say Claw of Fire, middle-aged and suffering from a painful spinal disease, didn’t inspire confidence in his troops. Perhaps the stars simply weren’t aligned. The Snakes were routed. A few years later, his rule in tatters, Claw of Fire died and took with him the dreams of a Snake empire. Most archaeologists say the Snakes never recovered but continued to wield influence. In 711 the Snakes’ strongest ally, Naranjo, declared it was still loyal to the Snakes, and 10 years later another Snake princess showed up at Saknikte. But by mid-century the Snakes had lost their bite. A Calakmul neighbor even erected a stela celebrating the return of the Bat kings that shows a warrior stomping on a snake. For the next century Tikal punished the city-states that had helped the Snakes—Waka, Caracol, Naranjo, and Holmul. The people of Saknikte, known as lovers not fighters, invited a Tikal princess to marry one of their nobles in 791. Yet Tikal would never attain the power reached by the Snakes, and by the mid-800s the Classic Maya were in collapse. Whether because of overpopulation, instability, or prolonged drought, the Classic cities fell into chaos and eventually were abandoned. Could the Snakes have prevented the collapse? What would have happened if Claw of Fire had beaten Tikal in 695? Someday we may have the answer. Forty years ago the Snake kings were a rumor. Twenty years ago they were viewed merely as the masters of Calakmul. Today we know they ruled the largest and most powerful Maya kingdom ever. Such is the maddeningly slow work of archaeology. Through glimpses and snippets, experts try to cobble together a coherent picture of the past. And often the experts disagree. Ramón Carrasco, an archaeologist who oversees the Calakmul site, says the Snakes never lived in Dzibanché and never declined from glory. He’s worked alongside Simon Martin and other researchers and seen the same evidence, yet he’s come to different conclusions. And so archaeologists keep looking for clues. In 1996 Carrasco was excavating Calakmul’s largest structure, a graceful pyramid dating to before 300 B.C. Near the top, as he carefully cleaned and pulled up stones, he discovered the remains of a body. And below that, a chamber. It took nine months to safely dig into the tomb and excavate it. When Carrasco finally got in, he knew that he’d found a powerful king. The body had been wrapped in a fine shawl and covered with beads. The king was not alone—a young woman and a child had been sacrificed and laid in a nearby chamber. The eye was from a beautiful jade mask meant to honor the king in the afterlife. Later analysis showed that he was a portly man, perhaps even fat, with hardened ligaments in his spine. His tomb was elegantly ornamented.